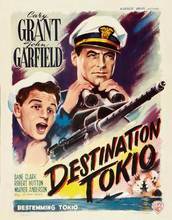 An American submarine sneaks into Tokyo Bay to deposit a team of spies to provide reconnaissance in preparation for Doolittle's Raid. Propaganda piece produced at the height of WWII, at a time when the outcome was still undetermined. In light of the circumstances quite good, though brimming with stock characters and on the talky side. Received an Oscar nomination for Best Original Story.